I’ve been in love with the iPhone for the past five years. I got the original as soon as it went on sale in the U.K. in November 2007, and I’ve had every model Apple has released ever since. My job has given me the opportunity to play with plenty of other devices over the years — including those powered by Android, BlackBerry, and Windows Phone — but I’ve always remained loyal to the iPhone and iOS. That was until a couple months ago, when my contract ended and it was time to decide which smartphone I wanted for the next two years. I already have the iPhone 5 — I bought it unlocked when it was launched back in September — and I wanted an Android device to replace the Samsung Galaxy Nexus I broke late last year. 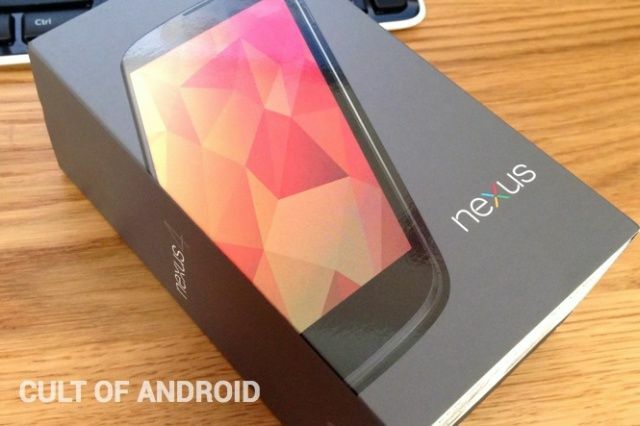 So I decided to pick up the new LG Nexus 4. 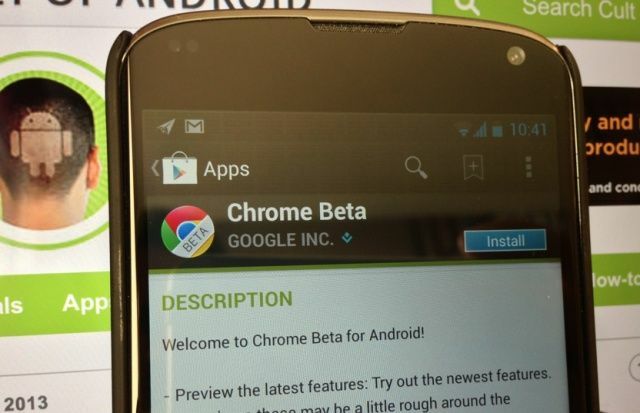 I was lucky; I didn’t have to wait six weeks for the device to arrive from Google Play. My carrier had plenty in stock, so a unit was delivered to my door the day after I ordered it. I was looking forward to testing it out, but I figured I’d play around with it for a little bit, then switch straight back to my iPhone 5 for everyday use. Like the Galaxy Nexus, I thought the Nexus 4 would be mostly used for work — testing apps and writing the odd tutorial for Cult of Android. But boy, how wrong was I.
I’ve been falling out of love with my iPhone 5 and iOS 6 since the day the Nexus 4 arrived. I’ve been falling out of love with my iPhone 5 and iOS 6 since the day the Nexus 4 arrived. It’s the first Android-powered device I’ve been persuaded to switch to for any extended period of time, and there are a number of reasons why Google’s latest smartphone has me hooked. It’s not just the hardware that I love; I’ve also been wowed by Android 4.2 Jelly Bean, and the improvements Google has made in its latest platform updates. In this post, I’ll run through some of the reasons why it has convinced me to ditch iOS — on my iPhone, at least. I wouldn’t like to say Android is better than iOS — or vice versa. For me, the two platforms are so different in so many ways that it all comes down to personal preference, and which one you enjoy using the most. They both have their strengths and weaknesses. Google’s open approach to software is a refreshing change when you’ve been playing in Apple’s “walled garden” for the past five years. But I’ve recently been enjoying Android’s strengths a lot more. Its customizability, flexibility, and Google’s open approach to software are a refreshing change when you’ve been playing in Apple’s “walled garden” for the past five years. And Android appears to be moving forward a little quicker, too; Google is making pretty big improvements with each major revision, whereas iOS is very much playing it safe. One thing to note before you move on is that I’m comparing the Nexus 4 and the iPhone 5 “out of the box” — neither handset has been rooted or jailbroken. That’s mostly because I haven’t seen a reason to root the Nexus 4 yet, and because the iPhone 5 jailbreak didn’t drop until a few days before I began writing this post. Your customization options with iOS are very limited. You can change the background wallpaper and you can rearrange your icons to suit you — you can even place them into folders if you wish — but that’s pretty much as far as it goes. With Android, however, the possibilities are almost endless. Not only can you rearrange your icons, but you can place them exactly where you want them — they don’t have to sit next to each other like they do on iOS if you don’t want them to. So if you have a wallpaper of your newborn baby, for example, and you don’t want their face to be covered by icons, you can place four apps at the top of the screen and four at the bottom, leaving the center clear. 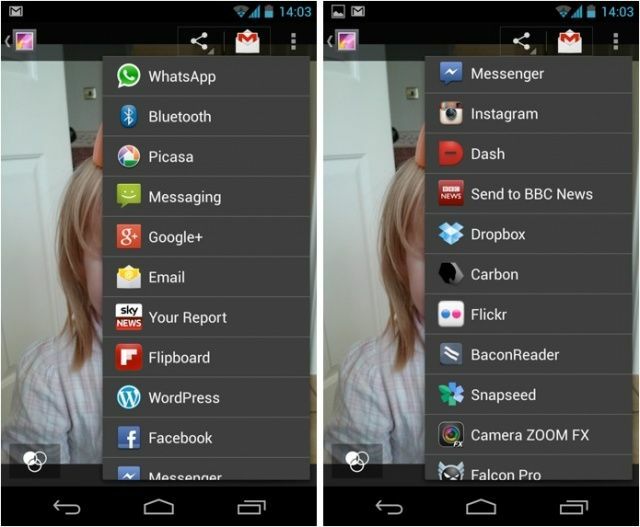 Android has folders, too, but they’re not limited to just 12 apps. I’ve never understood why this is the case on iOS; having to make numerous folders because you have more than 12 games installed is just silly. I quite like the look of stock Android, but if you choose to, you can give the platform a complete overhaul by installing a custom launcher. You don’t need to root or perform any unauthorized tweaks for this — everything you need can be found in Google Play. Just grab a launcher and download a theme you like — there are literally thousands to choose from. It annoys me when I have to open an app to see basic information on my iPhone. Ah, widgets. I’ve mentioned them time and time again — you’re probably bored of hearing it — but I love Android’s widgets. They provide you with all sorts of real-time information right on your home screen. You can view live sports scores, breaking news stories, your website’s statistics, the weather forecast, your email inbox, and lots more without opening a single app. And with Android 4.2 Jelly Bean, you can add widgets to your lock screen, so you get all of this information without even unlocking your device. I know widgets aren’t perfect; some are ugly, some consume too much data, and some will drain your battery life. But once you start using them and you begin to rely on them, you wonder why other smartphones don’t have them. When I use my iPhone now, it annoys me that I have to find and open an app for basic information — such as the weather forecast. The majority of Apple’s default apps in iOS are great, but I don’t want to be forced to use them if I don’t want to. I much prefer Google’s Chrome browser to Safari, and I like Sparrow better than Mail. But I still can’t make these default apps in iOS 6. So if I tap on a URL someone sends me in a text message, it automatically opens in Safari — whether I like it or not. With my Nexus 4, I can choose my default apps myself, and the ones I don’t like I never have to use. I’ve replaced Google’s built-in email client, text messaging app, and video player with third-party solutions that I prefer. I can’t uninstall Google’s completely, but they never get in my way. Sharing files between apps isn’t easy on the iPhone. This is a big one for me — the ability to share different files between different apps. Again, your options are limited on iOS; apps don’t really work all that well together, and moving things between them isn’t easy. Part of the problem is that Apple doesn’t allow us to access the iOS file system, so you can’t save files to certain folders that other apps can then access. As an example, I sent myself an MP3 file via email. On my iPhone, I could open it, or I could send it to Evernote, Dropbox, or a new email. On my Nexus 4, I could open it in one of three media players I had installed, or I could save it to my ‘Downloads’ folder. From there I had the option to send it to Evernote and Dropbox — just like on the iPhone — but I could also send it via Skype, WhatsApp, Bluetooth, or one of three email clients. I could also move it to other folders, copy it, rename it, or stick in in a zip file. Then there’s sharing to social networks and other services. On my iPhone, I can share photos in my camera roll via email, iMessage, Photo Stream, Twitter, and Facebook. I have Google+, App.net, Instagram, Flickr and more installed, but I can’t sent the image to them — I have to go into those apps and then find the image in my camera roll. When I take a picture on my Nexus 4, I can share it to WhatsApp, Bluetooth, Picasa, Messages, Google+, email, Flipboard, WordPress, Facebook, Instagram, Dropbox, Flickr, Snapseed, Twitter, Evernote, Skype… you get the idea. The performance improvements Google has made to Jelly Bean are outstanding. Ice Cream Sandwich wasn’t too bad, but on certain devices it had a tendency to stutter when you tried to do too much. But Jelly Bean’s “Project Butter” makes using my Nexus 4 a super smooth experience. The performance improvements Google has made to Jelly Bean are outstanding. Moving around the operating system, web browsing, taking photos, and loading and switching between apps is just seamless. The Nexus 4 does it all the moment your finger touches the display. Sure, certain games and apps — such as Grand Theft Auto: Vice City and Temple Run 2 — take a bit of loading, but you’d expect that on any device. The Nexus 4 actually feels like a premium smartphone. 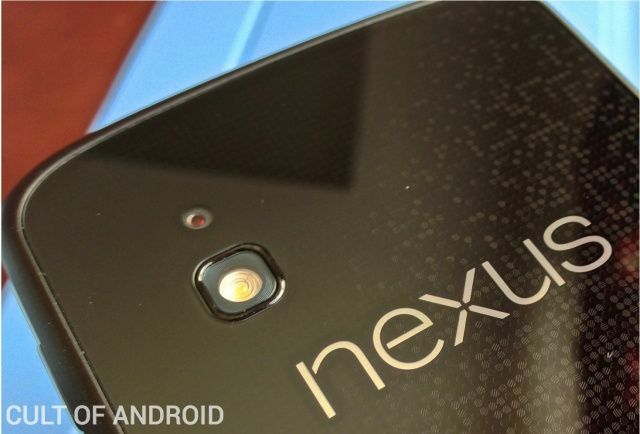 The Nexus 4 is a beautiful smartphone. I’ve used a ton of Android devices, most of them from Samsung, and they almost always feel plasticky and somewhat “cheap.” But the Nexus 4, like HTC’s high-end devices, actually feels like a premium smartphone. The front is dominated by that large glass display, which curves ever so slightly around its sides into a thin metal bezel. That sits on top of a soft, rubbery frame that feels great in the hand and increases your grip on the device. 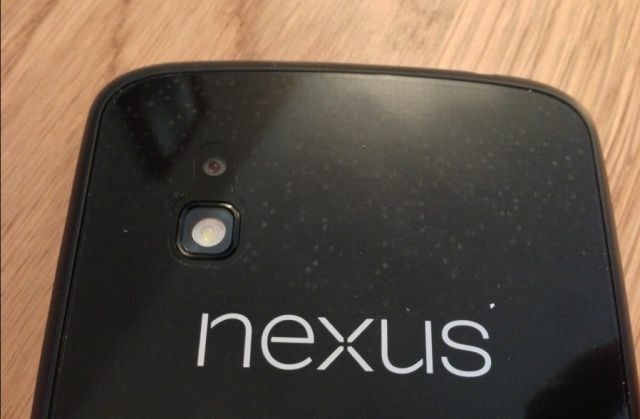 The back is also glass, and it has that trademark Nexus 4 pattern shimmering beneath it. Don’t get me wrong, the Nexus 4 isn’t as pretty or as luxurious as the iPhone 5, but it’s nowhere near as expensive, either. As Android smartphones go, its build quality is right up there with the best of them, and it’s another reason why I love it. As for its internals, the Nexus 4 is powered by a 1.5GHz quad-core Snapdragon S4 processor and 2GB of RAM, and as I mentioned above, it’s blazingly fast. I also love its large 4.7-inch display, which boasts 318 pixels-per-inch. That’s not as many as the iPhone 5’s 326 pixels-per-inch, but it’s not far off, and I’d sooner trade in a few pixels for the extra space. There are still some things I miss about my iPhone and iOS. While I’ve been super happy with my Nexus 4 for the past two months, there are things I miss about my iPhone and iOS. After all, I was an iPhone user for five years, and there was a lot of things I loved about Apple’s smartphone and its operating system. Here’s a few of them. 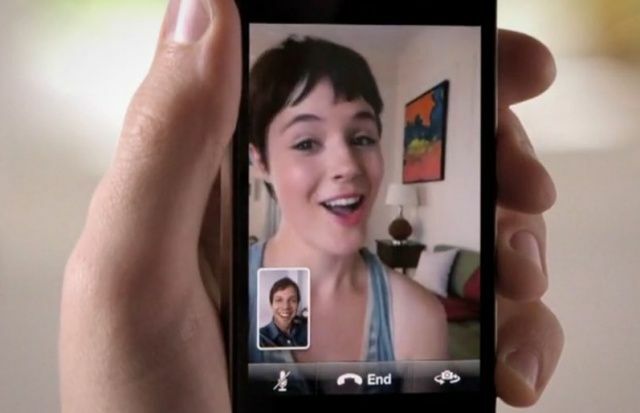 I know there are plenty of third-party services out there that can substitute these things, but iMessage and FaceTime are terrific — especially when almost all of your friends and family are using iOS devices. They’re built into every iOS device, and they take hardly any setting up — so even your parents can use them, and you don’t need to convince anyone to sign up to anything just to chat for free. The Nexus 4’s battery life isn’t bad, but it isn’t good, either. The Nexus 4’s battery life isn’t too bad, but it isn’t too good, either. And in comparison with the iPhone 5’s, it’s pretty disappointing. Even with plenty of use — including some gaming, web browsing, YouTubing, and phone calls — the iPhone 5 will easily get me through a day. I’ve never been in a situation where it hasn’t lasted until bed time since I got it last September. With the Nexus 4, however, I have to be a little bit more careful about how I use it. If I spend too much time on YouTube or playing games, then it will die before the day is out, and I’m stuck without a phone. Again, the Nexus 4’s 8-megapixel rear-facing camera isn’t too bad, but it’s not as good as the iPhone 5’s. I recently mentioned in my review of the BlackBerry Z10 that I’ve been spoiled by the iPhone’s awesome camera, and that I find it hard to get used to other smartphone cameras. And that’s certainly the case with the Nexus 4. I still use it a lot, and it takes good photos in well lit environments. But if I know I need really good shots and my iPhone is nearby, I’ll grab that instead. The iPhone 5’s speaker is significantly better than the Nexus 4’s. Smartphone loudspeakers probably don’t concern most people too much — if you can hear them, that’s all that matters, right? But they are a concern to me. I use mine a lot, mostly to listen to music or podcasts when I’m doing things around the house, but the Nexus 4’s is just downright awful. It’s quiet, but still sounds sharp and tinny. The iPhone 5’s speaker is significantly better. I have gotten more use out of my Bluetooth speakers since I got the Nexus 4, though, so I suppose that’s not such a bad thing. I love Apple’s App Store. I love Apple’s App Store. It might be “closed” and it might have a stringent review process, but at least that ensures that the apps and games you download are almost always well worth the price you paid for them. The software selection is second to none, and the quality of the apps it outstanding. Can you remember the last time you downloaded an iPhone app that looked awful and didn’t do what it was supposed to? I can’t. Sure, there are some good apps for Android, too. But there are nowhere near as many quality apps for Android as there are for iOS. I don’t mean to offend Android developers here — many do some terrific work — but all of the pretty apps are built for iOS. I only recently discovered a third-party Twitter client I really like (Carbon) on Android, whereas there are a handful on iOS that look great and do everything you want them to do. It’s hard to find truly great apps on Android, but they’re in abundance in the App Store. The other thing I don’t like about Android apps is that they hardly ever arrive the same time iOS apps do. Developers seem to make iOS the priority every time, and then worry about Android later on — if at all. So for now, I’m an Android user and I’m loving my Nexus 4. I’ll still hold onto my iPhone 5, and I’ll be looking forward to the next iPhone and indeed iOS 7. But I think Apple will need to make some significant changes to iOS to get me back — at least when it comes to the iPhone. I’m still very much in love with my iPad mini, and you won’t catch me swapping that for anything else.